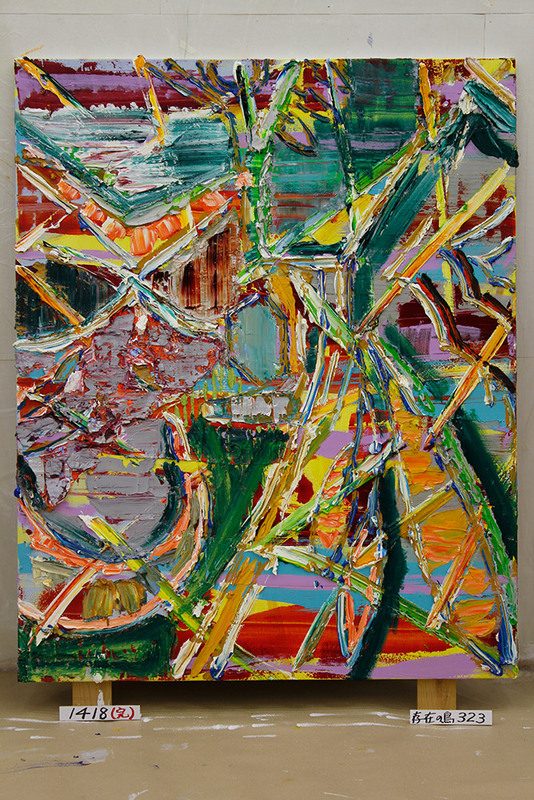 A Bird in its Existence is a series of paintings about flight in all beings. “To be” means “to fly”; only that which can fly exists. Even the rocks at the crest of mountains crack over tens of thousands of years and tumble down the mountain ridges. Flight is the pull of gravity; birds flying downward in the mountain ranges. Flight is transformation. Society itself, as well as all types of entities in society, regardless of what direction they may seek, continue to exist as flight. Wouldn’t we lose all hope if we didn’t view our demise as a form of flight? My initial idea, before changing the title to A Bird in its Existence, was The Sorrow of Not Even Denying Existence. There is a big difference between the two works in the series A Bird in its Existence. The colourful larger one generates a mood of openness and brightness, making you feel happy or encouraged. The other, with its sombre appearance, contributes to feelings of confusion and discouragement. It evokes the dark side of the world, which is slanting down, collapsing, disintegrating; or evil shrieking birds flying over dead soldiers or animals; or birds flying down to foretell our doomed destiny. 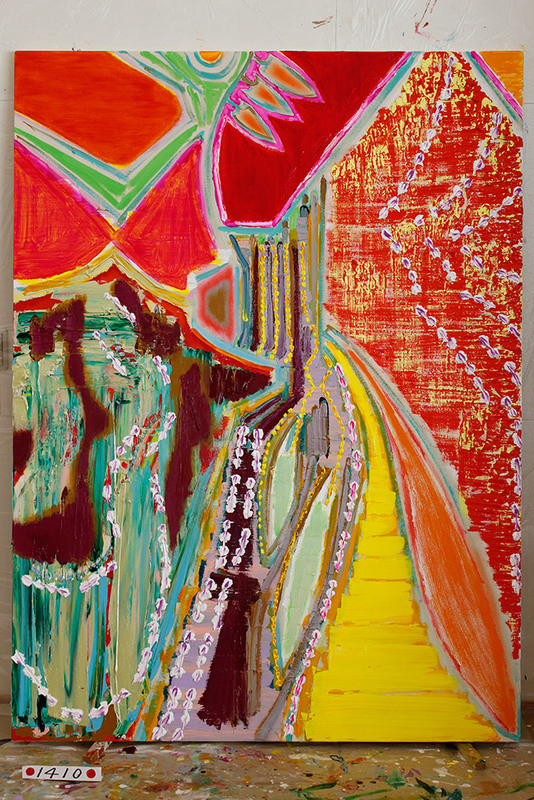 The Bird series is concerned with two dimensions of reality: the good and the evil, while the Broken Hermitage paintings have to do with destinies that don’t turn out as intended and echo the natural disasters that have struck Japan, such as the 1995 Great Hanshin-Awaji Earthquake or the 2011 Tohoku earthquake and tsunami. The diagonally off-balanced composition, the oblique structures, of these works lead away from any feeling of calm and peace. The disharmony of the colour selection causes discomfort. The difference between the Bird paintings and the Broken Hermitage paintings seems to be the difference between the spiritual and the artificial in life. But both are fully entangled in the real world, which we try to control, but eventually ends up completely uncontrolled, which leads to dissonance. Nakamura received a Master of Fine Arts degree in oil painting from Tokyo University of the Arts, studying under the Mono-ha artist Koji Enokura. 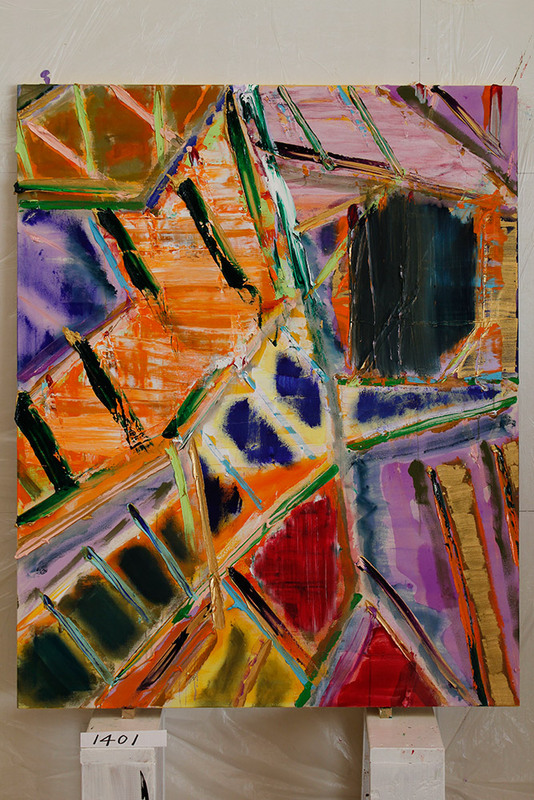 He debuted as a painter in the 1980’s, attracting attention for his Y paintings, expressionist works which employed “Y”-shapes as their motif. Following this came the Diagonal Grid, C Opened, Ranging Difference – Broken Shelter, Broken Hermitage, Saisoro, Shokusocho / Phoenix and other series. He has been tirelessly and dynamically exploring the meaning of pictorial space, producing more than 1300 paintings to date. 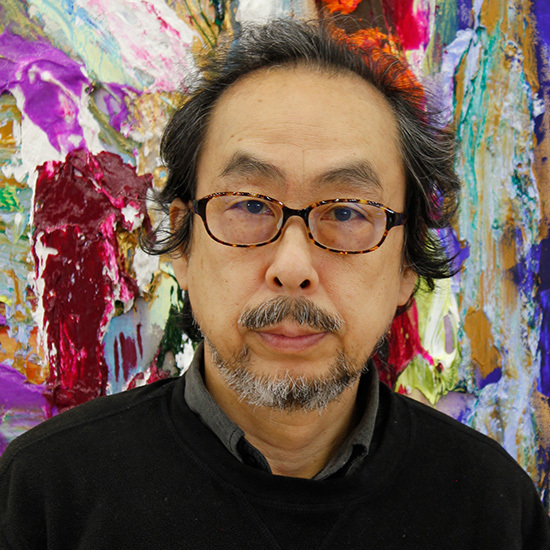 In Japan, he is recognized as one of the country’s most representative painters and has participated in many solo and group exhibitions, with several works in the collections of major Japanese museums. Outside Japan, he was also featured in group shows such as Europaria Japan ’89 (1989) and the Japan Art Today (1990-91) exhibition which toured Northern Europe. More recently, he has exhibited frequently in East Asia, particularly in China and Korea, and has also published a book of theoretical essays on painting, Toka suru hikari Nakamura Kazumi chosaku senshu/Filtered light: a Nakamura Kazumi anthology, Reifu Shobo, 2007.